These stones were purchased last weekend from the Sunday Market. I like them because of the natural and calming colors. Funny right. Some of you may find it to disturbing!..LOL. However, I am not very sure what stones are they. Can anyone help me here? I suspect the top two are agates. 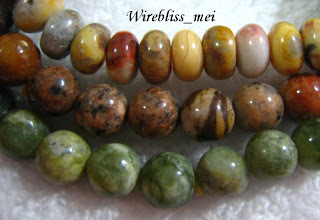 As for the bottom green one, according the man who sold them to me, they are jade...*scratching my head*. Never seen jade that look like this. But if they are, they must be very low grade jade as I didn't pay a lot for them. As for what I am going to do with them, I still have no idea yet. It is just one of my addiction, can't resist buying.